Today there are more than 18,000 yachts in the world. The yachting industry is therefore important and its opportunities are immense. The demand for luxury service and quality is constantly increasing. A career in yachting can be a rewarding experience and a wonderful opportunity to travel the world and explore new horizons. The yachting season in the Mediterranean lasts from April to September and from November to April in the United States and the Caribbean. However some yacht owners need crew all the year round. Morgan & Mallet Yacht Crew Recruitment Agency will support you and advise you on your career and your training. Our recruitment teams strive on a daily basis to provide professional development advice and help crews progress in the hierarchy of yachts. Our recruiters also offer advice to candidates on how to show their knowledge and experience to employers in the best way. In addition, we can provide help in CV presentation techniques. Our interaction and communication with crews and captains further the outflow of weak personnel and increase the formation of an efficient crew working onboard for many years. 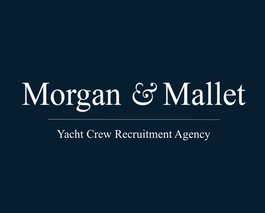 Apply to Morgan & Mallet Yacht Crew Recruitment Agency right now to find your next job on a sailboat, superyacht or megayacht. For your information, our agencies keep the personal data of candidates strictly confidential. As with any job interview, first impressions are very important. A neat appearance, a professional approach and a positive attitude are the key elements to attract a yacht owner or yacht captain.